Providers of prescription drug discount cards have increased their efforts to reach out to employers, despite the Affordable Care Act's or PPACA promise to decrease the ranks of the uninsured or those most likely to use the pharmacy discount cards. Since many of their employees do not work full-time, employers with lower wage workers are primary beneficiaries. Simply put, low wage employees tend to opt-out of the company health plan. Obviously, companies aren't required to cover part-time employees, but this card would provide them a benefit. Additionally, if employees opt out of the company plan this will also give them a benefit because the card is free to the consumer and free to the company. One pharmacy discount card can cover an entire family without any registration or paperwork. TransparentRx, a fiduciary pharmacy benefits manager, has negotiated discount prices at more than 65,000 pharmacies such as Walgreens, Target, CVS and Walmart. The discount prices are realized when their co-branded PrescriptionGiant discount drug card is presented by consumers. The price depends obviously on the chain, the prescription itself, and even location. Most of the discounts appear with generics, but many are brand name prescription drugs. The average savings for a discount card holder is 40% (not every medication qualifies for a discount) and can reach up to 75%. 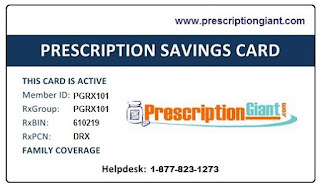 PrescriptionGiant, which seeks to reduce the cost of prescription medicine for children, families and individuals by $50 million by the end of 2020, is one provider looking to educate more employers about its discount card program. PrescriptionGiant does not charge membership fees or collect personal information.